It seems Valve are making an annual tradition of very strange end-of-year awards, and they’re certainly upping the weirdness this time. 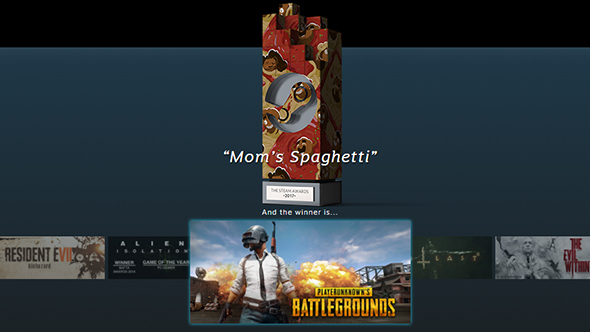 The winter sale brought us Steam Award categories like “Mom’s Spaghetti,” “No Apologies,” and “Soul Of Vitruvius,” and if you understand any of these please explain them to me in the comments. Valve’s actual descriptions only go so far. Our best PC games of 2017 awards are much more straightforward. We just picked the games we liked. All the categories were narrowed to a list of nominees by a combination of fan votes and a final decision from the “Steam Selection Committee,” which may or may not be a panel of robots. In any case, fan votes ended up determining the winner in each category. If you want to dive into any of those games, the Steam winter sale continues until midday tomorrow.